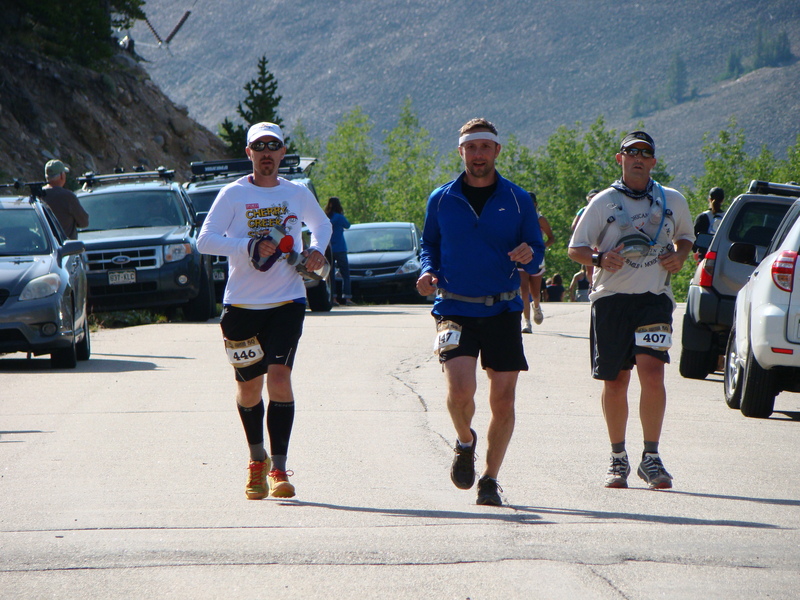 I hugged a man because he gave me Vasoline at mile 40 … but we’ll get to that in a moment. One of the fun things we did while in Leadville was take a train ride. 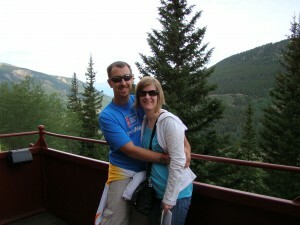 We have a good amount of photos of the mountains, tools on the train, and water tower. It was amazing the amount of history we picked up! The ride was 2.5 hours roundtrip and they had a snack car to get hot chocolate, coffee, popcorn, and candy from. At the start of the ride, we were roasting in the sun and applying sunscreen feverishly. Not too long after we were grabbing our jackets with the incoming wind and rain. Yeah Leadville! At the halfway point they stop the train and people can get off to look around. Did you know that the caboose of the train was used for firefighters to sit in and watch for fires? That way, if the steam train had embers or sparks that went into the woods, the firefighters could jump off the train and put out the fire. There are little boxes that peak out the top of the train car that they sat up in to see. This train had some of the old tools the firefighters would have used for this purpose. After the train ride we rode around to the aid stations so Tanya was familiar with them. Then we went down to City on a Hill for lunch. This place has great coffee and sandwiches that you have to try if you are ever in Leadville! After our lunch, we went down the street to a bookstore to get some books. Then, ice cream! 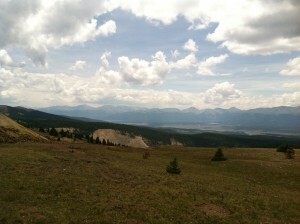 At that point we decided to head back to the Leadville Hostel to just kick up our feet until dinner. Jamie and Sarah came back from fishing and we decided to play a little Trivial Pursuit. Come to find out, the 80’s edition is harder then the Genius edition! Probably the biggest thing we did without kids? We ate hot meals that we didn’t have to make or cleanup after! On the day before the run the bikers get their shot at the course. Just like last year, we headed out to watch the start of the race from the top of the hill. Even looking at this photo, it is hard to really appreciate the incline of the hill. 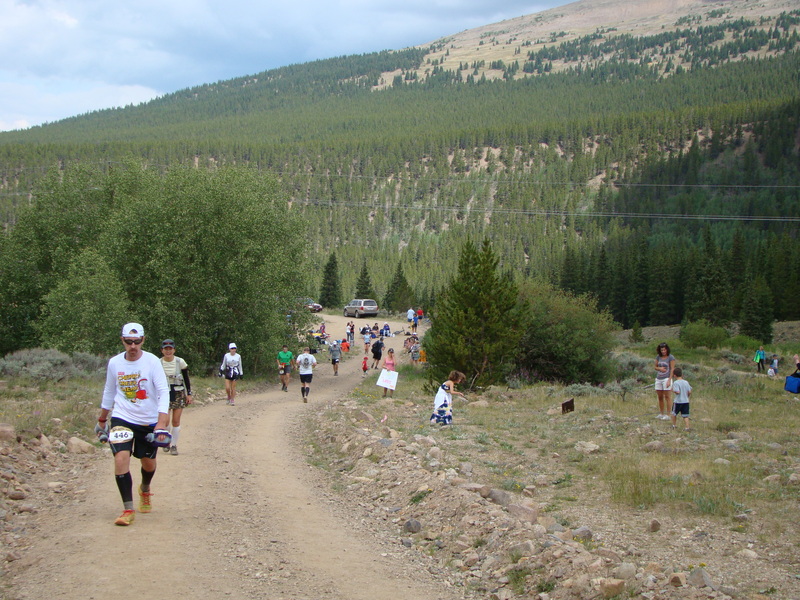 Remember, this is at 10,000 feet elevation and just the beginning of the race. Shotgun goes off and they “charge” for the top. In case you were wondering, nobody rides their bike up this hill. 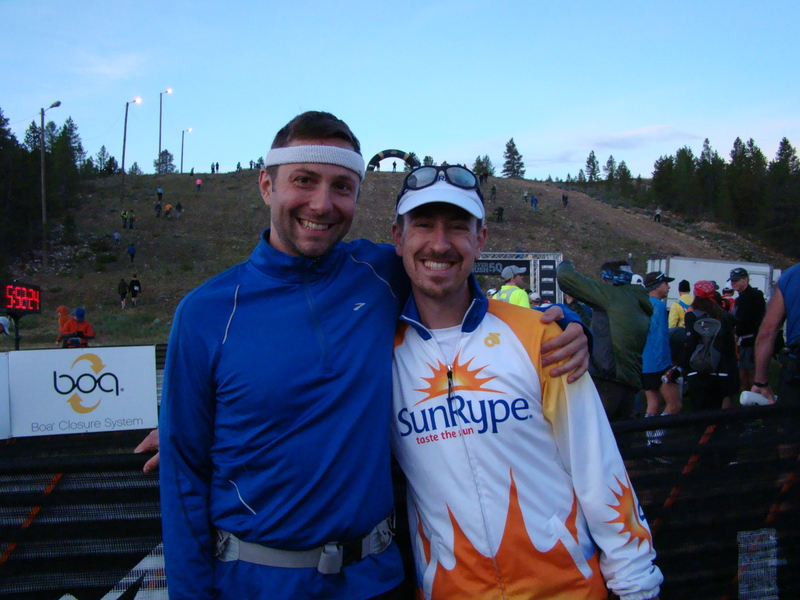 After hearing about my adventure last year, my buddy Jamie signed up to do Silver Rush as his first ultramarathon. We have done many training runs together over the past couple of months, shared stories, and enjoyed treating ourselves as guinea pigs. We snapped this photo at the top of the start while the sun was shining because we knew there wouldn’t be a time tomorrow. 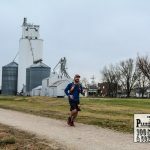 On to the 50 mile running adventure! We arrived to the starting line around 5:30a and went through our checklist of sunscreen, bug spray, and bathroom. Went through the items we wanted to start with which included the debate on wearing a jacket. At that time, it was about 45 degrees. 30 minutes later closer to 60. It made sense to not start with a jacket as I was going to get warm quickly. I did put on a long sleeve tech shirt that provided some cover from the wind. As we walked closer to the starting line, I heard Jamie say “it just keeps getting steeper.” Yes, yes it does. Photos don’t do this starting line justice at all. We were all smiles and excited for the race to get started. We chatted for a bit, I talked to some people around me, and waited for the countdown. Once the gun went off, there were 3 people racing for the top of the hill. 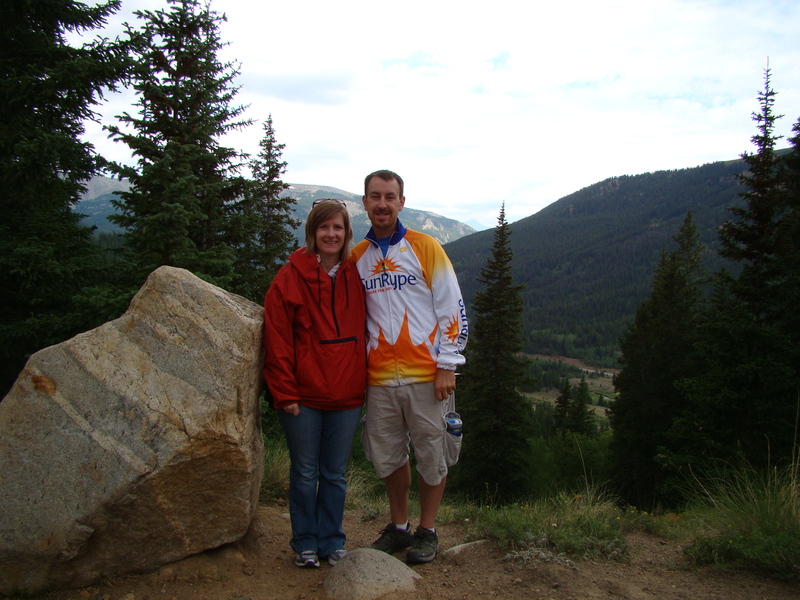 The first man and woman to the top gets a silver coin and can pay to enter the 100 mile race. No thanks. I already have my entry and will get a coin at the souvenir shop. Once to the top of the hill, there is a bit of a bottleneck entering the woods. Lots of people going from an open field to trail that holds 4 wide. Your actual race time starts once you enter the woods. That is right. The hill I just went up? Doesn’t count for time. That is to be considered fun a warmup. 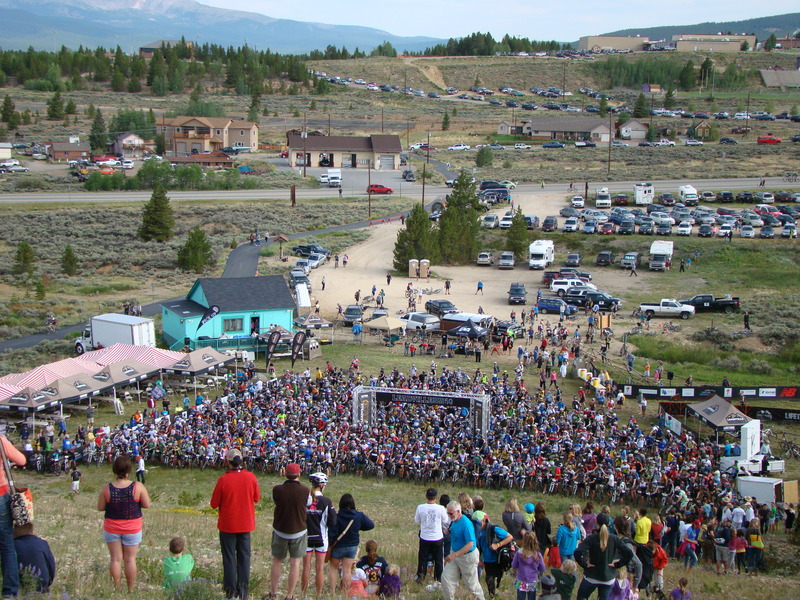 This is Leadville where the word tough is redefined. The trail looked very familiar to me from last year. Easy downhill descent, curving, and then a steep drop into single track. That’s mile 1. Then there’s a little climb that goes into some rolling hills. I don’t really notice the hills all that much as I still feel good. With every turn I was expecting a “memorable climb,” but each hill I came to didn’t seem all that bad. About 3 miles into the race, I met up with some people I chat with on Twitter quite a bit. It was great to put a voice with the tweets and exchange some positive words. Then I realized that this group runs a ton faster then me, so I let up on the speed to a more manageable pace. Still all good! 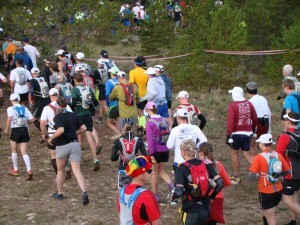 At the mile 7 aid station, I hiked a section with a 15 year old kid that has done a few ultras. He talked about how a few years ago he hurt his ankle to the point of ligament damage. His father said that if his ankle started to hurt that he needed to drop from the race. Very humble and nice kids. FYI … he finished the race in 11 hours. No joke! Coming into the mile 13.5 aid station I was still in good spirits. I just did about 3,000 feet of climbing and made it to this point faster then last year. Body was holding up well physically and keeping food down. I knew that I had a nice downhill ahead followed by a good hard climb. Still smiling which is a good sign! 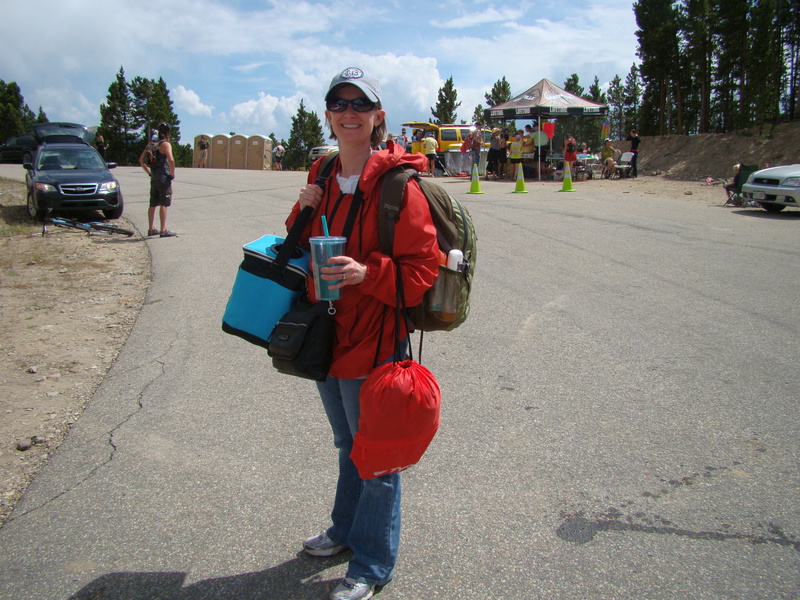 Tanya worked like clockwork as I came into the aid station. She grabbed my water bottles and did the half Gatorade half water combo. I went over to the table to grab some PBJ sandwiches, but they didn’t have any as the volunteers were a bit behind. I grabbed some watermelon, orange slices, chugged a cup of Coke, and snagged a handful of pretzels. Tanya brought me the bottles and I was off. 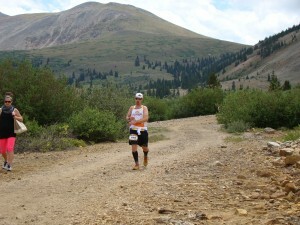 One of my goals of this race was to cut down the amount of time I spent in the aid stations. This first aid station time was just a couple of minutes. Awesome! Leaving the aid station I rolled down the hills, crossed the road, and started an ascent. 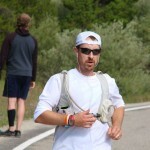 I caught up to Jamie and we chatted a bit about the incredible views along the course. It really is a breathtaking piece of nature to be out here and experience all of this. Several thousand more feet of climbing later, I made it to Mile 18 aid station. This is where I get to see the guy in first place on his way back. The turnaround is mile 25. I am at mile 18. He’s already gone to the turnaround and is coming back. I can’t even fathom running at that pace at this altitude. Incredible! Over the next 2 miles were more climbing, a curve, and then descent. It was at this point last year that my foot caught a rock and sent me sliding on my face. My knee was bloodied and arms scraped up. It seemed like an appropriate time to stop for a minute, reflect, and go to the bathroom. Another mile later started the ascent up to 12,000 feet again. I was feeling nauseous and no food was staying down. I had only consumed 2 gels (240 calories) at 4 hours into the race which I knew was bad math. I burn about 600 calories an hour so with the gels and some snacks, I was already running 2,000 calories negative. Bad way to start a day letalone a race. The climb to the top was certainly “memorable” but I wouldn’t say a complete killer. Runners that had already made it to the turnaround were on their way back down at this point. I made it over the top and started the tricky descent. It’s tricky because it is so steep! Along with being steep, the ground is angled inward like an upside down triangle. At times, it feels as though I’m going down as slow as I went up. Once I was close to see the turnaround, I could tell something was different. The race has an inflatable arch where the timing mats are located. The one I saw at the turnaround appears to be up on a cliff. I remember saying outloud “that’s weird, I wonder if there’s another race going in the other direction.” Nope. They added a steep hill inside the turnaround point. Thanks for that. The look in the photo I have at the turnaround is one that I have had only one other time in a race. It is the look of someone that thought they were going to get by then someone hit them in the face with a water balloon. You got here faster then expected! Me: Thank you. The stay at this aid station will be longer then expected. My stomach was not getting better and any chance at putting food in my mouth was reduced with the reaction of dry heaving. Wonky stomach was coined by me for the day and I was going to find a way to fix it. Just like last year, I had Tanya make an avocado and turkey wrap for me. The problem this year was thinking about eating it made me want to puke. I was able to get half of a wrap down. My method? Take very small bites and chew like my 7 year old does. Her method is an obnoxious put food in your mouth and chew with your mouth open as loud as you can. Hey, it worked and made me laugh. Thanks for that Mackenzie. Sidenote: Tanya told Mackenzie this the next day and said she can only chew with her mount open if she’s running 50 miles. As I sat there on the side of the hill at the turnaround, Tanya added sunscreen, sprayed me with bug spray, and Jamie’s girlfriend Sarah handed me salted watermelon. That was another first … salted watermelon. I probably won’t eat that when watching the Super Bowl, but perfect for a 50 mile race. Leaving the aid station I knew what was ahead. That mountain that I just tip toed down would now have to be climbed. This was going to take some time, but I was already thinking about the hill after it … 10 miles later. That is generally not a good sign to think that far ahead. Climbing up this mountain feels like an understatement. There was a moment where I thought there should be a ladder it was so steep. It hurt to keep going and it hurt to stop. There was zero way to drop out at this point … except to fall and roll down the hill. I sat down 3 timmes and puked once. Nothing staying down, but kept drinking diluted Gatorade to get some kind of substance. Once making it to the top of mountain, running down seemed just as unpleasant. I would do little bursts of running to even out the pace to around 13 minute miles. My feet were getting sore, knee had a sharp pain, and the stomach was wonky. I had already saw one lady DNF due to altitude sickness and that was not going to be stopping me today. More climbing later, made it to the spot again where I fell last year. Decided to have a seat for a few minutes and reflect on how far I have come in one year. It was a good 4 minutes of relaxing the brain and body. A couple guys hiked by and asked if I needed anything. Nope, just enjoying nature. I got up and followed the 2 guys up the hill. Come to find out, they were both retired doctors and just listening to their conversation was fascinating! Made it up over the hill and rolled down into the mile 29 aid station. Grabbed a little soda, orange slices, and PBJ. They were almost out of water so I filled up what I could. Ken Chlouber, the guy who started all of this in 1983, was on his way to bring more water. As much as I reallllly wanted to wait around and talk to him, I decided it would be best to continue moving forward. Rolling on down the hill, went through the switchbacks, and knew that I was just a few miles from seeing Tanya again. I also knew that she was going to lecture me politely about not eating, but can’t do much about that. About 2 miles from the aid station I met up with a guy named Blair. Come to find out he used to run for his college cross country team and now lives in Arlington. We had a similar pace strategy so we decided to run together. Both of us had some knee issues and were losing the will to run. Doing the math we knew we were not in danger of cutoff times, but for me, I knew patience would get the best of me and I’d have to run eventually. 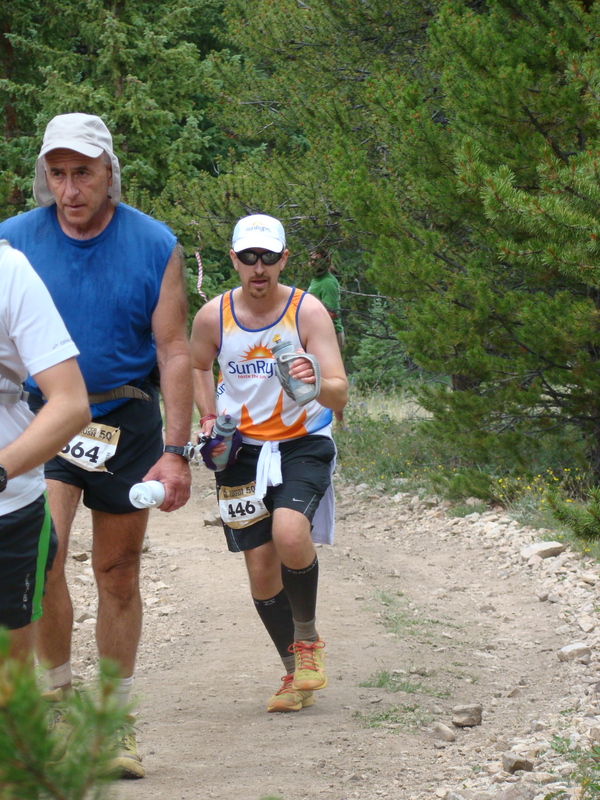 We were catching up to people on our power hiking and climbing the last hill into mile 34 aid station. I was about 25 minutes ahead of what I had told Tanya. As I got to the top of the hill, I spotted my first spectator and was thinking that I would have to tell him to go yell for Tanya. Instead, she was next waiting for me! T: How are you feeling? A: Not eating anything, but otherwise feeling just pleasant. 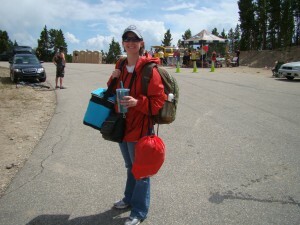 T: Want to run a little to the aid station? A: No thanks. I’ve already done that. Me telling a joke. Good sign! Tanya gave me another dose of sunscreen, bug spray, and water bottles. Jamie came in just as I was leaving. Last time I saw him was at the top of the mountain and he looked spent. He said he puked everything he had which gave him a nice reset. 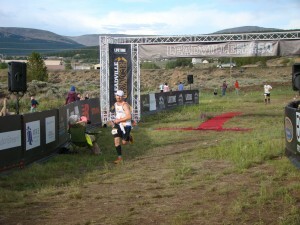 He was ready to complete his first ultramarathon! Blair and I agreed to make sure we left the aid station together. As I was ready to go, I went over and met his girlfriend Sam. We chatted for a bit and off we went hiking the hill ahead. I knew we had 3 miles of up ahead. Nothing like the ladder steep mountain we conquered over an hour ago, about enough to test the will of moving forward. The sun was beating down on the back of my neck and the wind giving me a gentle push. All-in-all the climb went really well. I figured it would take about an hour and 20 minutes … it turned out to be 10 minutes faster then that! As I was about a mile from the top, I decided to turn around for a different view. Well, that view was of dark storm clouds heading towards me. Uh oh. I could hear the thunder. There was no longer burning on the back of my neck. It was getting chilly. Made it to the top and gingerly started the descent. About 3 miles until the last aid station. It wasn’t too long down the hill when the weather hit. Hail. Hard, small pellets, and lots of them. Me: Maybe we should hide under a bush until this lets up. Blair: I don’t know. I’ve never run in hail before. We ducked under a bush for a couple minutes to let the storm pass a bit. A couple other runners joined the idea and I took the opportunity to stretch out. The hail seemed to lighten up a bit, so we jumped out and trotted down the trail again. As I made it to the mile 40 aid station, I was feeling some chaffing pain on the inside of my legs. When I say pain, I mean border line blood coming soon pain. Me: Sir, do you have any Vasoline? I think he was a wizard because he spun around and next thing I knew he held in his hand a jar of Vasoline. After applying the Vasoline, grabbing some Sprite and pretzels, it was on to the homestretch! I knew pretty much the rest of the way was downhill and was prepared to take advantage of gravity. With Blair, we did what we called “2 minute quick steps.” Just lift your feet and lean forward for a couple minute intervals and let gravity do the rest. Controlled falling. About 3 miles from the finish, Blair told me to go on as he didn’t have any quick steps left. 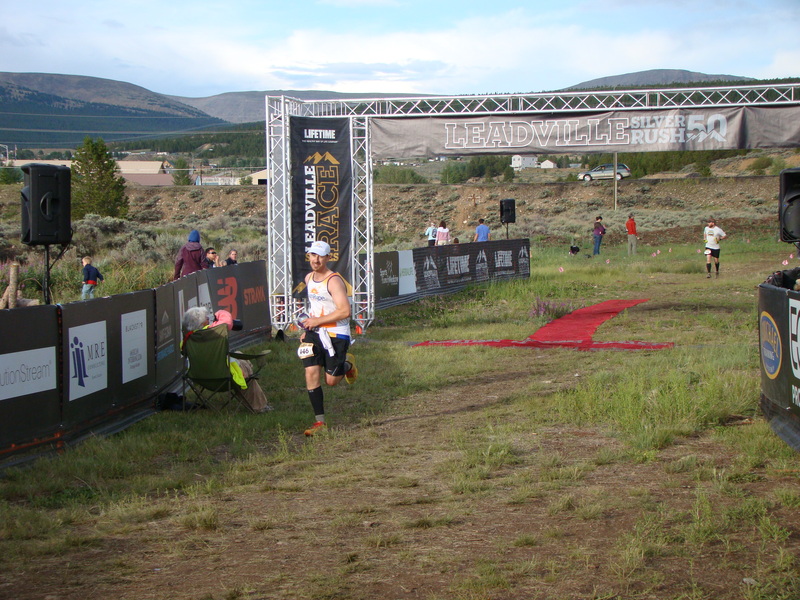 He was looking strong and I knew he would be finishing his first ultramarathon today! I took off down the trail and turned off the part of the brain that registers pain. I caught up with a guy that I had chatted with on the course a few times. We talked about how much we were not liking climbing. That had to be a sign that a new obstacle was added this year. Instead of going down the steep hill you start at this race, they take you around the hill to avoid injury. Well, this year they moved the finish line to the opposite side of the hill then last year. That was a great opportunity for them to add another steep 100 yard hill about half a mile from the finish. Thanks for that. Four of us made it to that hill at the same time and all had words for the hill. I can’t repeat that conversation here in case my kids are reading this. One of the cool things they did add this year was that you run across the top of the hill so everyone can see you coming. 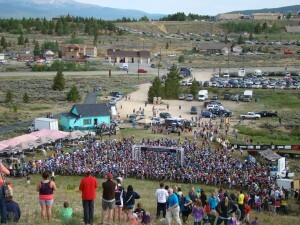 The announcer calls out your name and tells you to get down there to the finish line. After they called my name, they blasted the Rascal Flatts song Life is a Highway. Just happens to be one of Tanya’s favorite songs, so I was left wondering if she had made a special request. I came down the hill and around the corner to the red carpet of the finish line. As I crossed the finish line, I threw my bottles into the air, did a dance around the finish area while picking them up, and raced over to Tanya. Apparently I blew by the volunteers handing out the medals because they chased me down! I had a sudden burst of energy and was just excited to stop. Jamie was perched in a chair at the finish line waiting. He made it there 13 minutes before me … I could have sworn he was going to get there an hour ahead of me, but as ultras do, things can change on you quickly. 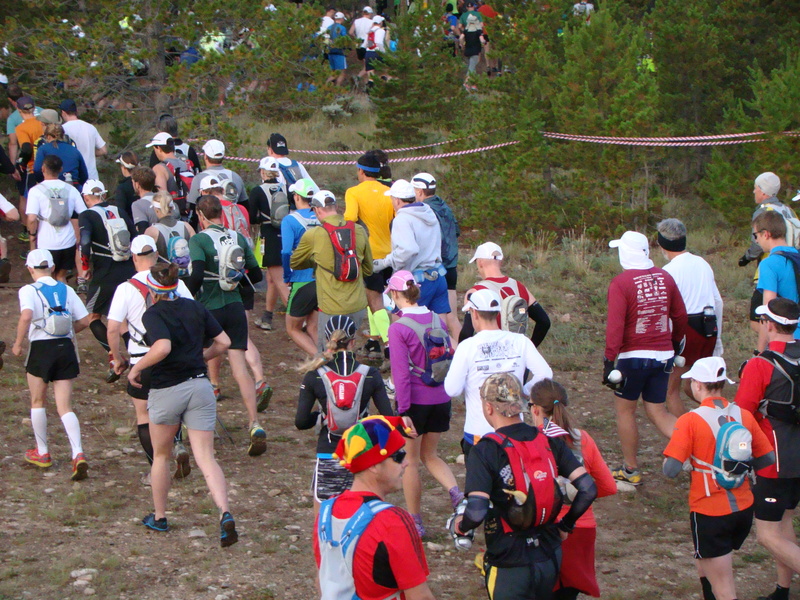 There are no mile markers on the course, so you have to go off memory of how much farther to go. After 12 hours moving on your feet, it is tough to remember a trail you were on that long ago. All I knew was that I needed to eat. I hadn’t really eaten anything in 3 hours, so mathematically that could not be a good thing at all. 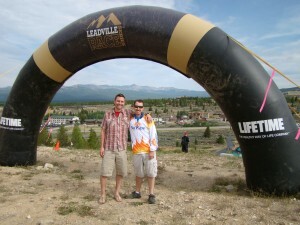 Leadville being awesome as usual had pulled pork sandwiches, coleslaw, fruit chips, and beer. Felt good to sit and pick at some real food. Met Ken Chlouber! 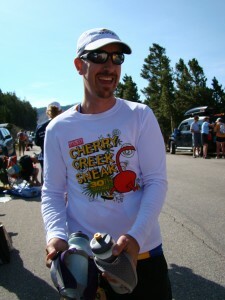 As we were leaving the finish area, Ken was coming in with his big grin and energy. I stuck out my hand and said thank you for starting all this. He shook my hand, gave Jamie a hard pat on the shoulders and yelled congratulations. Super cool! great writing Alex, wonderful discription of your race, thanks. It was an amazing day, Alex. Thanks for talking me into it. All I did was suggest you do it … the work and journey was all done by you! Thanks again for helping me get through those last few tough miles. Great blog! Blair – It was great meeting and running with you! By the way … I have a pacing spot open for miles 50-60 if you want to power hike with me during the Leadville 100! 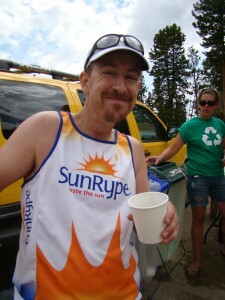 Hey, it’s the SunRype guy! I was yo-yoing with you for several hours. I think you were there when I was ready to hug the porta-potty at one of the inbound aid stations. It was nice that I kept seeing you, as all my other friends were much faster and were way ahead of me. I was fairly lonely, and liked seeing a face that became familiar. Good job finishing a tough race! Good luck on the 100 – I’ll be out there crewing/pacing this year. Lisa with the red shirt! 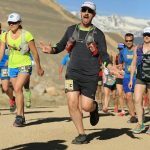 It was great to spend some time with you on the trail through the heat, hail, downhills … pretty much everyone I knew finished ahead of me so happy to help another! Look forward to seeing you at the 100! So sad we are so behind, but glad to finally be reading your recap!! Cute pic of you and Tanya! How cool that your ultra running anniversary was celebrated with a friend kicking off their ultra running!! Ummm, anyone who can rescue you from chaffing with vaseline deserves a hug!! We would have done that too! haha Love all of the “thanks for that” comments with things they changed this year! Wow, what an accomplishment, Alex!! Way to go out there!